It seems like Shikhar Dhawan is on a spree to acquire all the traits of Virender Sehwag and today he ran himself out in bizarre fashion, just the way Sehwag used to get out in his heyday. However, the funny part was he looked very confident about the landing, but the giant screen showed otherwise. In the second T20I in Cardiff, Dhawan fumbled his bat and got his body over the line but failed to make any contact with the ground when the ball hit the stumps. It was an unlucky way to get dismissed and one that ended India's hopes of winning the game. Today, with the series on the line, India needed their best batsman in the United Kingdom to perform to the best of his potential, but once again, he found a weird way to get out. On the fourth ball of the 18th over, Virat Kohli nudged a Moeen Ali delivery to the left of square leg. While there was never a run on offer, Dhawan started running for a single, only to be on his way back. However, Ben Stokes was quick to collect the ball and immediately, fired in a rocket at the non-striker’s end. While a dive would have made sure that he was safe, Dhawan instead attempted to slide his bat in. 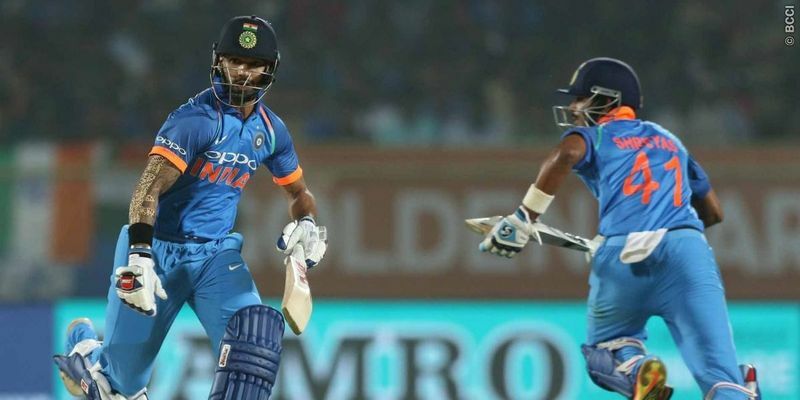 As the Englishmen appealed for the wicket, Dhawan appeared to be confident that he was well within his crease and when Virat Kohli casually asked him whether he was out or not, Dhawan signalled that he had made his crease. However, what came on the screen was sufficient to silent the Indian crowd as it showed that the opener’s bat was behind the line when the ball hit the stumps. Another careless dismissal - something the Indian fans wouldn't have liked anyway.